highlight the capabilities offered by its technical services group for press-system modernization and press-relocation support. SDT technology promises to increase press output and improve a stamper’s ability to produce value-added components using enhanced in-die processes such as welding and assembly. Schuler also will introduce its new PowerFeed coil-feed units designed to keep up with the demands of SDT metalforming presses. Booth visitors also will learn how Schuler can bring aging machines up to state-of-the-art performance by offering control-system upgrades, electronic transfer system retrofits, automatic die change, press-to-press automation, die cushions and complete press overhauls/rebuilds. 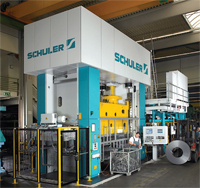 Lastly, Schuler Hydroforming will feature its full range of technical services and production capabilities for tubular and hollow parts.